This kitty became a member of our house on December 20th. We had a Christmas Open House for friends. He decided that he could come to the open house. He had follow the girls home a few weeks before the open house. Since following the girls home he stalked our house every few days. The girls had given him a name, Aslan. I think once you name a stray it becomes yours. So when he made himself known at the open house he became apart of our family. The video is his first encounter with a Zhu Zhu pet! 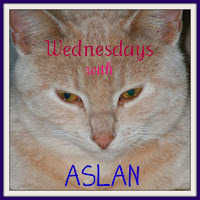 Each Wednesday we will post something new about Aslan! If you like cats and have something to share please post! If you have a blog about cats let us know and we will come visit! He was at first! The zhu zhu came charging after him! Now he attacks it and even finds it in my dh's room.